Now here’s one for coincidence freaks. Shortly after purchasing this album in Gurteen I embarked upon a tour of Lissadell House, not far from Carney in County Sligo, and once the home of the Gore-Booth family whose most renowned member was the Countess Markiewicz, though Henry the artic explorer comes a close second. Who should my vastly knowledgeable guide be but none other than Paul Gunning and there he is, somewhat smaller and rather younger, school-uniformed and sitting next to his mother Carmel in one of the family photographs included in the liner for The Sligo Maid. 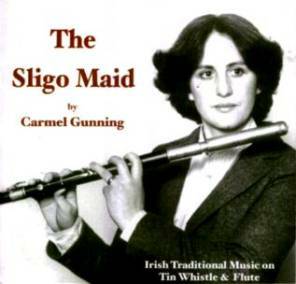 A fine photograph of similar vintage graces the cover of an album which should firmly reinvigorate the faith of those who believe that, when a tin whistle’s played well, and Carmel is astonishingly proficient musician, then it’s up there in the heights with the more celebrated instruments, such as the flute and fiddle. And ignore the fact that Carmel’s holding a flute in the picture, for this is very much a whistle album. Any Irish traditional music fan asked to nominate a favourite tin whistle album would almost certainly come up with the name of Mary Bergin and refer to her two Feadóga Stáin records or perhaps Seán Ryan and his pair of recordings for the same Gael Linn label. Unequivocally, The Sligo Maid is firstly, the finest album Carmel has made, and, secondly, one which should elevate her name not only to the same level as those of Mary and Seán, but lead to widespread recognition of the skills of a unique musical talent. If such sentiments appear to be the result of the reviewer spending too many hours in Hargadon’s or Shoot the Crows (and track nine is called Let Us Be Drinking! ), then have no fears, for this review is being compiled under the influence of a cup of some fruit-flavoured tea, though the identity of said succulent is indiscernible from the flavouring. Firstly, apart from the sheer grace of Carmel’s playing, vivacity when needed and delicacy when not, The Sligo Maid is a remarkable compilation of tunes and one where the musician has clearly thought long and hard about sequencing. Next it features a fine blend of tune-types. Sure, as one would expect from Sligo, there are plenty of reels, but, largely, these are juxtaposed against other forms – jigs, flings, hornpipes, slip jigs and a slow air – so there’s ever a sense of the unexpected here. Thirdly, the standard and positioning of the accompanists (Charlie Lennon on piano and Junior Davey on bodhrán) is extraordinarily apposite. Charlie is eloquently understated throughout and Junior provides a bodhránista’s master-class on The Mayo Lassies. However, and not diminishing the impact of her sidemen, it’s the Gunning whistle and occasional flute which firmly steals the show. Literally blowing hot, it’s sometimes impossible to imagine how she manages to finger so quickly or even take sufficient breath, as on The Maid of Mont Cisco, while maintaining such appropriate control of the tune’s melody. The impact is astounding. Also not to be forgotten are Carmel’s skills as a music teacher, admirably brought to the fore by the appearance of two of her pupils, flute-player Olivia McTernan and guitarist Ciarán Mulderrig on the reels Dan Breen’s and Martin Wynne’s No. 3, but, ultimately, it’s the sound of her seeming free-spirit of a whistle rollicking through Lord Gordon and The Mason’s Apron which lingers in the memory (and how she manages those repeated notes I’ll never know).